Homemade firbeglass wind turbine blades. Home brew vacuum infused wind turbine blades. This page isn't going to make much sense unless you understand vacuum resin infusion. If you don't then I suggest to read my vacuum infusion pages first. For most people, myself included, home wind power is not a practical option. Unless you live in a particularly windy spot (typically near the sea) there just isn't enough energy in the wind to make it worthwhile. If we can make cheap enough turbines we can get away with slightly weaker conditions but due to the cubed nature of the speed to power curve we don't actually gain very much. For most places I suspect sails are a more appropriate technology but I'm not ready to go there. Being somewhat knowledgeable about composites I decided to explore making a simple fibreglass turbine blade. The shape is a section of a cylinder. Because of the taper used it actually behaves like it has a twist - with the tip having less pitch than the root. People have made similar shaped turbines from plastic pipe but I doubt they will prove to be durable. The actual shape I used was a 300mm model helicopter blade scaled up by a factor of four. I needed a piece of 400mm diameter cylindrical mold to make them in. I already had some 1mm polycarbonate sheet lying around. So I went to the local 'crazy clarke' shop and bought some 380mm plastic wash basins ($2 each) and wrapped the sheet around them with masking taped holding them in position. Most resins are not compatible with polycarbonate so I used epoxy for the surface layers of the mold and vinyl ester for the bulk. It didn't go smoothly and the mold started to de-laminate at the boundary when I was removing it. In this (above) photo you can see a model helicopter blade laying in the mold. The turbine blades are molded between sheets of polycarbonate. The bottom sheet is inside the mold. This sheet has the blade outline scratched into the surface. These scratches are transfered to the final piece making is easy the trim the blade accurately at the end. To the right of the mold is the template used for cutting the glass to size. Far right is the top sheet. This has a row of 1mm holes in it for infusing the resin down into the glass. The blades are tapered in thickness. The bulk of the glass is about 550 grams/sqr/mtr woven cloth. There is one layer of light cloth at each surface covered with facing tissue. There are three layer of the heavy cloth at the tip and one extra layer is added every 200mm. Here the stack of glass is complete with surface tissue on top. 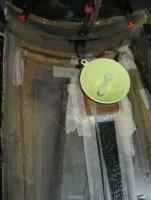 Now the glass is covered with the top sheet of polycarbonate and a strip of ecofusion is taped along the row of infusion holes to form a path for the resin the flow. The whole thing is covered with a plastic film and the air is removed by a vacuum pump. Both the infusion and vacuum ports are modified suction cups. The vacuum line is at the tip and out of the photo. The resin feed was a failure. It was a modified plastic milk bottle with a plastic tube. The resin flow was too slow and the resin in the bottle overheated and set. With the first batch of resin cooked I went the plan B.
I plugged a syringe into the resin port and used that to supply the resin. It this photo you can see the resin has filled the ecofusion and is wetting out the glass below. This infusion worked but the glass slipped out of position - this is why one of the blades ended up the wrong shape. For the second attempt I replaced the suction cup infusion port with a piece of rigid PVC foam with a hole drilled in it. I used a modified funnel to add the resin. The funnel had a small syringe in the nozzle but this later proved unnecessary. Here is resin is infusing. You have to be careful not the add the resin too quickly so the port can be sealed when not being used. Here the resin is infusing into the tip area. This tends to be a tense time as the flow slows down. It is surprising how often the flow stops a few mm form where you want it to go. There was some trial and error before I got enough infusion holes in the right places. You need to mix the resin in small batches so it doesn't overheat before it is infused. I pre-weight quantities of resin and hardener so I can quickly mix them as needed. This (above left) is one of those cases where the resin didn't quite infuse far enough. This was fixed by improvising a small infusion port. One the right a small dam was made out of putty - this was filled with resin then a small hole was made in the plastic film to allow it too infuse into the dry glass. This worked perfectly and the repair was not even visible in the finished blade. This is a cured but untrimmed blade as it comes out of the mold. Here are three of the four blades I've made. Vacuum infusion does provide a fairly practical way to make wind turbine blades on the cheap. The actually material used is around $20Au per blade and weighs almost exactly a kilo. A 2.4 meter blade scaled up in all dimensions would cost $160 and weigh eight kilos. In practice you wouldn't increase the tip thickness is it would be less than that. Beyond this size the scaling factors rapidly make it impractical and would have to go to a much more complex design. When things went well (ie no vacuum leaks) the weight was extremely consistent. Three of the blades I made were within one percent of being the same weight. Created by system. Last Modification: Wednesday 25 of July, 2007 15:55:12 AEST by System Administrator.